He’s been by your side for millions of miles on mountain hiking trails and city streets. He’s accompanied you on numerous hunting trips and weekend getaways. He’s your best friend, you constant companion, you’re closest confidant, he’s your dog. 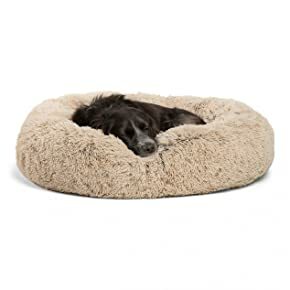 Do something for him by making sure he’s comfortable in an orthopedic dog bed that is perfectly suited for all his needs. How Do You Choose An Orthopedic Dog Bed? How Do You Get Your Dog To Like Their New Bed? As our best friends get older, they need a firmer cushion to support their tired bodies. Thick, firmer cushions help to relieve discomfort from arthritis, hip dysplasia, and pressure points caused by old age muscle loss. Choosing a bed with bolsters, or raised areas like the arms of your couch, gives your pooch something to rest their head and neck on for even more comfort. A thicker, firmer bed also makes it easier to get up from if your aging pup is experiencing any muscle weakness. Picking the right orthopedic dog bed is going to depend a lot on your dog, your living situation, and your budget. Your dog’s size and favorite sleeping positions are absolute musts to consider as well as where you plan on putting the bed. Finally, orthopedic dog beds have a wide, wide range in prices. Size Considerations: The bigger the better when it comes to the bed for your older buddy. Make sure the bed is something he can lay out on without hanging over the edges. Also, factor in his favorite sleeping positions. If he’s a sprawler, you might want something even bigger. If he sleeps tucked in a tight ball, you might be able to get away with something smaller. Another consideration is where you are putting the bed and if you have the space for a king sized one. Pad Density and Thickness: In order to help relieve some of your best friend’s pain, you want a firm pad that will bounce back to its original shape immediately. You don’t want anything that squishes down and then stays squished or something that is so soft your dog will practically have to swim to get out of it. It also needs to be thick enough so that pressure points don’t poke through it and rest on the floor. Generally speaking, two-four inches is thick enough for most dogs, but you may have to go thicker for larger breeds or heavier pals. Memory foam, like the stuff in some human mattresses, seems to be a popular choice as it is firm and doesn’t lose its shape easily. The Shape of It: This is totally up to your dog’s preference. Let’s bring back the bolster idea. Most dogs love these to stretch their head and neck on. They also provide a back rest or barrier between the bed and the wall. Bolsters can also make your dog feel cozier and surrounded by comfort. When picking the shape of your dog’s orthopedic bed, you will need to again consider their sleeping habits. Most sprawling sleepers will fit better on a rectangular shape, while balled up sleepers will fit an oval or circle shape. Ability to Clean: The ease of cleaning an orthopedic dog bed should be a huge consideration. Choose a bed that has a waterproof or water resistant cover that can be removed and machine washed. Trust me, you and your dog will be thankful for it. Older dogs not only struggle with pain and discomfort, but some can experience incontinence issues as well, so waterproof or water resistance is a must. Special Features: After you’ve found a bed that covers the basics, you can start looking to add some bells and whistles. For example, some beds have an almost sleeping bag like top so that your buddy can burrow in nice and cozy. Other’s have an oval indent in the center of the pad to make the perfect outline for a balled up sleeper. There are heated and cooled beds too. You can get a little crazy with these extra features, I would just say find one that you and your pup are comfortable with. So now that you know what to look for in an orthopedic dog bed, let’s get to the list of the top seven beds on the market. If you want your dog to ‘sleep like a baby’ this may be the bed for you, literally. 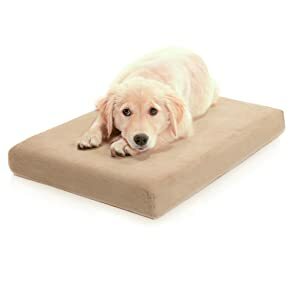 Friends Forever Orthopedic dog beds are made from baby mattress grade memory foam. That means a firm and comfortable base. The base is surrounded by poly-fill bolsters that provide a soft resting place for tired heads, hips, or legs. This bed is covered with a water resistant liner and a soft suede, anti-tear, machine washable cover. Friends Forever Orthopedic Dog Beds seem to work really well for large breed dogs. Many consumers have worried that they wouldn’t be able to find a bed large enough for their extra large pup, but found that this bed did the trick with room to spare. This is a huge plus to keep tired limbs from hanging over the edge. Consumers also liked how easy the suede fabric cover was able to be vacuumed and washed over and over again. A couple downsides to this bed is that the zipper and bottom fabric of the cover don’t hold up as well as the rest of the bed. The bottom fabric, the part that touches the floor, is a lightweight version of the top and isn’t scratch-proof. Also, the zipper tends to separate from itself and from the bottom fabric when used a lot. Overall, if you’re not worried about your dog flipping this bed and tearing at the bottom, you should fair well with it. The support and comfort of it seem to be there to ease aging bodies and the foam pad holds up well to repeated or uninterrupted use. If you’ve got a big dog, you need a Big Barker. This bed is specially designed for large breed dogs. The 7” thick foam is guaranteed to not flatten over time. Big Barker claims that the foam will retain at least 90% of its support for at least 10 years. That’s pretty impressive! Big Barker beds are said to be so comfortable that even humans will enjoy them and nobody, dog or human, will sink through to the floor. The cover is made from a soft microfiber that is durable enough to withstand digging and it comes off easily for machine washing. The Big Barker bed includes the rectangular, 7” thick pad and a soft bolster on one end, making it an ideal doggy lounge. The Big Barker Pillow Top Orthopedic Dog Bed is definitely designed for those large and extra large breeds. The sheer size of it as well as the thickness and durability of the foam make it perfect to fit those large, heavy bodies. A possible downside to the Big Barker bed would be that you have to purchase the waterproof liner separately, otherwise it’s not waterproof. You’re probably going to want something waterproof to keep ‘spills’ from getting into the foam where it’s very difficult to clean out. This bed seems to be the top for large to extra large breed dogs and I think the 10 year foam guarantee speaks for itself. KOPEKS asks you to compare the memory foam in their orthopedic dog bed to the foam in high end human mattresses. With high end foam 7” thick, this bed ought to be comfortable for your pup. It also features two water-resistant covers surrounded by an outer micro-suede cover to deliver snuggly softness. Another added bonus is an anti-slip rubber bottom to help it stay put and to keep your pup from having to chase it around the house. Pet parents seem to like the thickness of the pad so that even extra large pups don’t sink through to the floor. They also like the softness of the cover and the durability. The size and comfort of it makes it a good product for large dogs with hip dyplasia and arthritis. Some consumers complained that the bed never regained its shape after shipping. The foam is supposed to unfold and expand to fill the cover but some of the beds stayed lumpy and hard. This can be frustrating if you order this item online in hopes that it will be a comfy product for your sore buddy. Some have also said that the water-resistant liners allowed liquids to leak through to the foam causing it to stain and smell. Overall, this bed seems to work very well at making large dogs comfortable as long as it unpacks properly so that they get a chance to use it. Dogbed4less makes a 4” thick, high density memory foam, simple rectangular bed. This bed comes with a waterproof internal cover and two external covers so you can switch it up or have an extra one for laundry day. One of the covers is made from heavy duty denim and the other is made from a soft micro-suede. The foam is high density meaning it won’t squish down over time and will offer support for years to come. People like that this bed is made from one solid piece of high density memory foam instead of several pieces glued together. This makes the bed more supportive, less lumpy, and the foam more durable and comfortable for all sizes of pups. Apparently the waterproof liner isn’t very waterproof and allows urine to seep into the inner foam pad. Also, some persistent dogs were able to rip up the covers and then the foam pad. 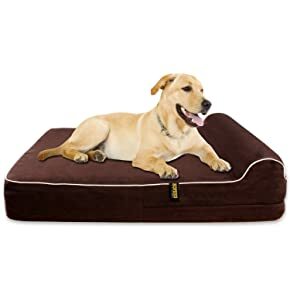 Dogbed4less Premium Orthopedic Memory Foam Dog Bed is a nice option if you want a simple, comfortable dog bed for your favorite friend. Having two external covers to choose from gives your dog some different options, but if your pooch is a digger, this may not be the bed for you. This BarksBar Orthopedic Dog Bed is perfect for snuggly sleepers. 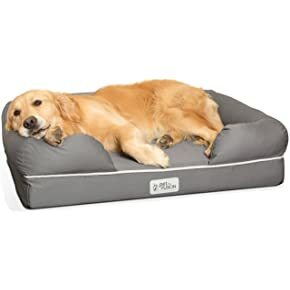 The 4” thick human-grade orthopedic foam is topped with soft cotton padded walls and an ultra soft, quilted cover to make a cozy cocoon for your pooch to nest in. The cover is also washable and rubber backed to prevent it from sliding around the house. Dogs seem to really like how snuggly this bed is. The softness of the cover along with the pillow walls makes it ultra cozy. The 4” orthopedic foam stands up to large breed and help relieve pressure points. A major downside to this bed is that it doesn’t have a waterproof or water resistant cover. Also, the quilted cover doesn’t hold up to the scratching before lying down that some dogs do. This may be a better bed for those dogs that don’t scratch or dig and that don’t have any incontinent issues. It does seem to provide comfort for dogs with arthritis or other orthopedic issues. Millard makes an orthopedic dog bed made from one 2” layer of memory foam over a 2” foam base. 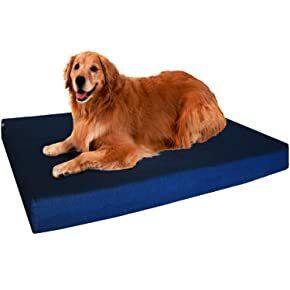 The memory foam is made to contour to your dog’s body, while the bottom layer of foam offers a sturdy base for the memory foam. The bed also has a waterproof cover to go under the non-skid polyester cover. Millard’s Orthopedic Memory Foam Dog Bed is shaped and sized to make a great crate bed, but it can also be used on its own. Dogs really like the comfort of it and it seems to help ease achy joints while still being firm enough for them to get up without much trouble. Being sized to fit in a crate is a nice addition. People have complained that the foam can mold underneath the waterproof cover. This is most likely due to leaks or punctures in the cover. If you get this bed, it may be important to remove the cover and let it air dry often to keep this from happening. A simple rectangular bed, the Millard Premium Orthopedic dog bed may work for you as long as you can take the time to air it out on occasion. PetFusion combines a 4” memory foam pad base with recycled polyfill bolsters to provide overall support for your best friend. The outer cover is water resistant to slow leaks from getting to the inner waterproof liner that surrounds the pad. The bolsters also have a water resistant cover. This makes lounging easy for your dog and cleanup easy for you. Dogs really like this bed. The bolsters make great head and neck rests for those dogs that like to sprawl when sleeping. The foam also holds up well even for heavy dogs so it can offer support for achy joints for a long, long time. Some pet owners have complained that the cover just doesn’t hold up even to just washing. The zipper tends to break and the seams come apart. Even if your dog doesn’t scratch or dig, the cover might not be long lasting. 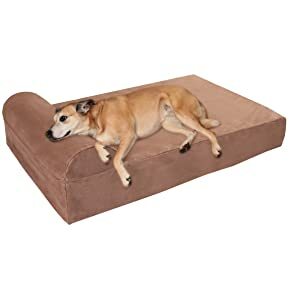 This could be a great bed for your achy pup, but you might want to purchase extra covers or find a cover that’s a little more durable so that your dog won’t ever have to take a break from it. The Dog’s Balls compares their Orthopedic Memory Foam dog bed to that of the experience of sleeping in a five star hotel. Now that’s comfort! This bed features a 4” high stability foam base layered with 2” of premium grade memory foam on top. The bed is covered in a removable, washable waterproof liner with a durable suede and faux fur outer cover to provide comfort and protection against leaks. Most dogs were immediately attracted to this bed and like it. The soft cover was especially enticing. It also seemed to hold up well, even for heavy dogs, and they didn’t immediately sink to the floor. Some consumers complained that the waterproof liner leaked and soaked the inner foam. There was also some issues with the bed squishing down too much when the dog laid on it. This bed also isn’t the best for dogs that like to sleep cuddled in a ball as all that pressure in one area can cause them to sink through. The Dog’s Balls Orthopedic Memory Foam dog bed is a very simple design, just a rectangle with no bolsters. The foam is thick and seems to be comfortable for most dogs. The outer cover is soft and inviting while the inner cover will help repel leaks. There is also replacement liners and covers available if needed. This Shag Donut Cuddler is just that, a plush, soft, donut bed perfect for dogs that want to burrow down and cuddle up. The cover is made of a faux fur finish with a water-resistant nylon bottom. 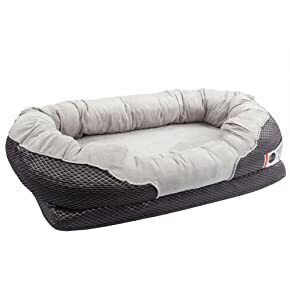 This bed offers a 360 degree raised rim that allows pups to rest their head and neck or burrow in the deep crevices created between the bottom and the sides. It also offers a sense of security and comfort and is completely machine washable. Dogs really get cozy in this bed. The faux fur and comfy softness make them feel like they’re cuddled up next to Mama again. With the rim completely encircling the bed, it makes it so dogs can sprawl out or curl up, whatever their sleeping mood may be. Shipping may be a problem with this bed as some customers reported that it never fluffed up after removing it from the vacuum seal. They also reported little support in the center or bottom cushion of the bed. The faux fur doesn’t withstand washing as well as desired either. Once washed a few times it tends to get stringy instead of staying fluffy and soft. The Shag Donut Cuddler made by Best Friends by Sheri is a great bed for dogs that like to sleep curled up and cuddly. The fluffy rim provides comfort and security while the faux fur cover provides cozy softness. 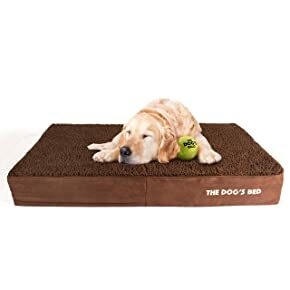 This bed might not have the best support in the center, however, so heavier dogs with hip or other orthopedic problems might benefit more from a thicker, firmer bed. This sofa-style bed offers a quality egg crate foam base that provides support for achy joints and a thick poly filled back and bolsters for head and neck comfort. The foam is covered with a quilted faux fur cover, while the bolsters are encased in a chenille cover. All covers are soft, luxurious, and washable. This bed is huge! It’s big enough and supportive enough for even the biggest dogs. The foam also stands up to extra weight without just squishing down. Having the back and bolsters allows dogs to sleep in a variety of positions for increased comfort. The cover doesn’t hold up well to scratching. With a soft finish like faux fur or chenille, it’s no wonder. So this bed definitely isn’t for dogs that like to chew or dig. It also doesn’t provide any water-resistance, so dogs with incontinence issues won’t do well with this bed. While the cover is completely machine washable, the foam is what you have to worry about. FurHaven Orthopedic Sofa-Style Couch Bed is a great choice if you have a big dog that normal large dog beds just don’t fit. 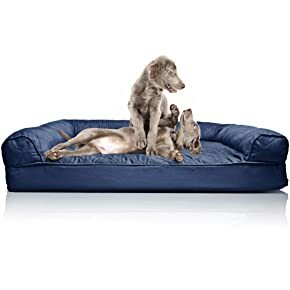 This bed is big, thick and supportive, however, the cover might not hold up to diggers and chewers and it’s not waterproof or water-resistant. This bed features a thick memory foam base that is supportive as well as fire resistant and antimicrobial. It is surrounded by soft, padded bolsters for head and neck support, and has a non-skid, waterproof bottom. The cover is removable and washable and includes a waterproof liner for the memory foam. As a bonus, JOYELF provides a free squeaky toy for your pup’s enjoyment. The memory foam pad of this JOYELF Orthopedic bed isn’t as thick as other beds at only 2”; however, it is dense. It works well for small to medium size dogs to ease pain associated with orthopedic problems. The all-around bolsters also provide comfort and allow your pet the ability to sleep in a variety of comfortable positions. This bed doesn’t hold up to dogs that chew or dig. The soft cover isn’t as durable as others against teeth and toenails. A major complaint for this bed was the smell. The memory foam is treated to be fire-resistant and can pack a chemical smell with it. This smell usually dissipated within a couple of days if you can stand it for that long. 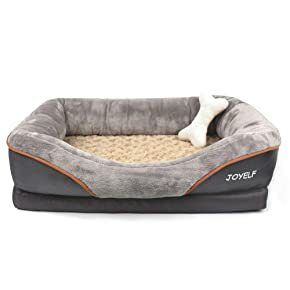 JOYELF makes a nice orthopedic memory foam dog bed for small to medium size dogs. It’s probably not the best choice for larger dogs as the pad isn’t as thick and might not stand up to a large dog’s weight. It’s also not a bed for diggers and chewers. 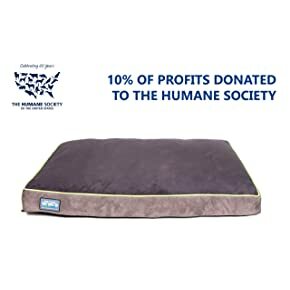 This orthopedic dog bed by Better World Pets offers memory foam in a shredded version that is then packed together. This provides supportive comfort without being as dense as regular memory foam. It’s a simple rectangular design with 5” of padding for achy joints. It also features a removable, washable cover and inner waterproof liner. Even large, heavy dogs can use this bed. The thickness of the padding holds up well without squishing down. It’s very supportive without being too firm and the waterproof liner seems to be able to withstand the occasional accident. With the memory foam being shredded and then packed, this bed has a tendency to get lumpy, especially with repeated use. The pad is divided into different sections using baffles to keep the foam from shifting to one side of the other, but the different sections never seem to be at the same height. This can make it more uncomfortable, especially for smaller dogs. 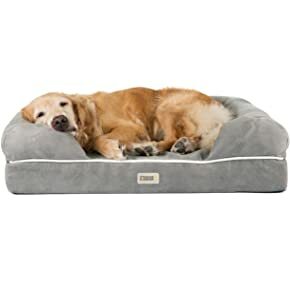 If you want the memory foam experience without the firmness, Better World Pets Orthopedic dog bed might be for your dog. By shredding and repacking the foam, it makes a supportive but softer bed for achy, tired joints. However, this also makes the bed have a tendency for lumps. No matter which orthopedic dog bed you choose, if he doesn’t use it, it won’t do him any good. Getting your pup used to his new sleeping space may be harder than you think so here are some tips to get him comfy in his new spot. Put the bed in a familiar location: Place the new bed in the same spot that the old bed was, but don’t get rid of the new bed just yet. Your pup may not take to the new bed like you planned, so keep the old one around just in case. Place the new bed in the old location and see what happens. If there is some resistance continue reading. Make it smell familiar: If your pup has a favorite blanket, toy, etc, place it on the new bed. You can even try lying with your dog on the bed if that helps. Have fun on it: Play, give treats, and praise your pup for using the new bed. Make lying on it fun, not a punishment. Sometimes dogs just won’t take to a new bed and that’s okay. Don’t give up after just one day, keep trying for at least a week before you decide if the new bed is a no-go. If after a week he still doesn’t want the bed, you might have to try something else. Fortunately here are 12 orthopedic dog bed options to try.